Additions, corrections, and further information should be posted to this thread, and I will add them to the above article at regular intervals. For a few weeks, I've been thinking that I could add an article page listing films that featured the LNER. Obviously there are lots of modern documentaries and videos, so the page should concentrate on fiction. The page could also include fictional books (cf. Andrew's Arthur Ransome reference) and TV. So as people see films that reference the LNER, please could you make a note of it by replying to this thread? In a month or so, I will then collate them into a new article page. As new references are added to the thread, I can add them to the page. References should include the title, year, prominent people (actors, directors,etc), and a description of the reference. Be wary of multiple versions of the same story (Railway Children and The 39 Steps come to mind). I'll kick things off in a few minutes. Last edited by richard on Sat Aug 26, 2006 3:22 pm, edited 2 times in total. The hero, Hannay escapes from London on the Flying Scotsman. This is seen leaving King's Cross, hauled by an A1/A3 Pacific. Hannay departs the train after pulling the chord in the vicinity of the Forth Bridge. Mistake: The stock footage of the train leaving a tunnel, is actually hauled by a GWR 4-6-0! Interestingly, in the novel Buchan has Hannay fleeing from St. Pancras and the West Coast route (via Crewe). Virtually all the action occurs in the vicinity of Kings Cross. The house is located over Copenhagen Tunnel. A mockup of the house was used for these shots, but the front of the house is a real house located further south near St. Pancras. There are lots of shots of A3s, V2s, N2s, etc as would be expected in the vicinity of Kings Cross in the 1950s. Dinah Sheridan, Jenny Agutter, Bernard Cribbins. Features the soul surviving Gresley N2 0-6-2T No. 4744, which was based on the Keighley & Worth Valley Railway at the time. I cannot add much to your list other than that many years ago I saw a film featuring Flying Scotsman. If my memory serves me it involved the actress actually scrambling along the outside of the carriages as the train was steaming along. The film was in black and white. The film was half made with captions (in 1929) and before film sound technologies had been fully perfected. Revolutionally, the second half of the film carried sound. I apologise for not knowing more about the film. The film may even have been called "Flying Scotsman" but I cannot be absolutely certain about that. It was very dramatic and I'd love a copy of it - lots of exciting photography! Hope this jogs someone's memory? There are some nice, atmospheric shots taken at Waverley as Hannay joins a northbound express hauled by an A4. His attempt to persuade the Police that he is a newly-wed fails when his "wife" rebuts his advances, so he opens the compartment door and climbs along the outside of the train. An A1 or A2-hauled express on the up line nearly swipes him (don't try this at home, kids). 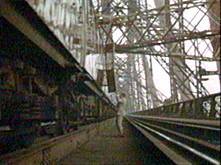 The pursuing Police stop the train, which is by now in the cantilever section of the Forth Bridge. 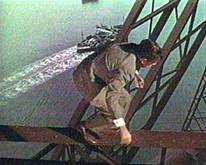 Hannay eventually escapes through an inspection hatch in the four-foot and, scrambling over steelwork high above the Forth, makes his perilous way down to South Queensferry. I guess the "railway" scene lasts 5 or so minutes. The film is available on DVD - I got my copy from eBay for a few quid - and is fantastically atmospheric throughout. See http://www31.brinkster.com/decapod/ohmrporter.htm for more shots from the film itself, which is surprisingly enjoyable. Last edited by Bullhead on Sat May 06, 2006 2:33 pm, edited 1 time in total. A few more for the collection, would you like more detail? York station disguised as Harrogate with 4472 (also disguised as 4474 and 4480). Vanessa Redgrave, Dustin Hoffman. Dir. Michael Apted. Some shots on Forth bridge with A4s. Carry on team. Dir. Gerald Thomas. 4472 at a number of East Coast Main Line locations and Hertford Loop. Moore Marriott, Ray Millard, Pauline Johnson. Dir. Castleton Knight. Scenes at Welwyn Tunnel. Stephen Murray, Patricia Plunkett. Dir. Cavalcanti. Buntingford branch with 65464. David Niven, Yvonne de Carlo, George Cole. Dir. Mario Zampa. LNER tank arrives at Skegness. Jack Warner. Dir Ken Annakin. 61606 arrives Liverpool Street. John Mills, Cecil Parker. Dir. John Guillermin. Temple Mills with J39, J69, 8591 and 8607. John McCallum, Jack Warner. Dir. Robert Hamer. J15s 7835 and 7541 at Longmoor and Denham. Robert Donat, Marlene Dietrich. Dir. Jacques Feyder. Between Kings Cross and Potters Bar, various trains. Alec Guiness, Peter Sellers, Herbert Lom. Dir. Alexander Mackendrick. Kings Cross area, Hertford Loop, Doncaster with 2547, J15. John Stuart, Anne Gray. Dir. Alfred Hitchcock. Silver Link at Kings Cross. Will Hay, Moore Marriott, Graham Moffat. Dir. Marcel Varnel. KWVR with 52044. Robert Stevens, Colin Blakely. Dir. Billy Wilder. KWVR with 52044 disguised as 957. Dinah Sheridan, Jenny Agutter, Bernard Cribbens. Dir. Lionel Jeffries. 70011 (at Lpool Street?) Newmarket with B1. Kay Walsh, Bill Owen. Dir. Basil Dearden. Felixstowe with F6. Dirk Bogarde, Michael Redgrave. Dir. Lewis Gilbert. Stratford Works, Liverpool Street with 8788 and 2616. John Loder, Peter Haddon. Dir. Reginald Denham. 60147 on Forth Bridge. Kenneth More, Barry Jones. Dir. Ralph Thomas. Bedford to Hitchin with HR103. sarah Miles, Eric Sykes, Terry Thomas. Dir. Ken Annakin. Wow. Barry Norman, eat your heart out! I'm pretty sure that the Silver Link naming ceremony isn't shot at King's Cross. It's a smallish rural station somewhere, where Hay saunters casually into proceedings and ends up soaking the guests from the water crane which is partially visible in the picture I posted earlier (only visible if you log in). I've just re-watched the railway scenes from the 1959 "39 Steps". There are 3 A4s featured (in this order): 60024 "Kingfisher", 60012 "Commonwealth of Australia" (carrying "The Talisman" headboard arriving in platform 11 at Waverley), and 60027 "Merlin". 60012 subsequently features a second time. The passing train which nearly clips Hannay is hauled by an A1 or an A2 but it is too blurred to read its smokebox 'plate. As Hannay struggles to pull the inspection hatch cover back over on the Forth Bridge, the train passing on the up line is hauled by 60162 "Saint Johnstoun". Last edited by Bullhead on Sat May 06, 2006 6:19 pm, edited 1 time in total. 52A: That's a long list! However I think you have the wrong year for "The Lady Killers". I'm only aware of two versions. The Ealing version based around Kings Cross was from the 50s. The Coen Brothers' version (Tom Hanks takes Alec Guinness's role) was much more recent. Alas no LNER in that version, although the central gag remains intact. Bullhead: Thanks for the extra Kenneth More 39 Steps info. I've actually heard some very bad things about this version! Leonard Maltin and the blurb in my copy of the novel describe it along the lines of "a lesson in how not to make a thriller/suspense movie"! I don't know, I haven't seen it. The Hitchcock version is definitely early Hitchcock, but it is still watchable today and there are elements which re-appear in his "Hollywood era" - eg. a number of parallels with "North by North West". Filmed in Somerset and mainly featuring ex-GWR and ex-SR types; however the regular (14xx hauled) train's coach is from the Wisbech and Upwell. Two of this type were built - the other one survives in preservation. Last edited by richard on Sun May 07, 2006 2:52 pm, edited 1 time in total. John B & 52A: I think I've heard of "The Flying Scotsman" and may have even seen clips. I wonder if it is available on DVD? Can't help with trains, but the earlier thread of York Station Starring as Harrogate. In Charriots of Fire, it played London Victoria, but since knowing this I haven't seen the film to know if any LNER is there. Well spotted!! Typo I'm afraid, date should be 1955. Scene at 50:52 of A4 Pacific 4491 (60012) charging towards the screen at high speed. Note; you cannot tell which engine it is at normal speed, only through the aid of DVD, and then you can't get the number on the side of the cab (the front is too dark!) as the film has been reversed, and the number is completley backwards! Scene 55:00 on the forth Bridge, a super emposed A3 tavelling in the opposite direction, number loos like it ends in 2 or 82, but is too blurred to be sure. This is adapted from the Ealing screenplay. Donald Sinden as one of the thieves ("The Captain") and Johnny Morris as the parrot! Some stock steam noises - but no chime whistles. Are we just talking movies, or can we do tv aswell? Right at the end there is a shot of 60009 carrying the king. There's also the opening sequence of "Poirot", which features a Silver Jubilee livery A4 as a symbol of the mid-30s luxury, alongside RMS Queen Mary and an Imperial Airways HP-42. In the remake of "The Railway Children" (in which Jenny Agutter features as the mother), the railway scenes are - very atmospherically - shot on the Bluebell Railway where ex-NBR J36 "Maude" puts in several appearances and hauls the train which brings the children's father home at last. The Scottish theme is continued by Gregor Fisher (best known as Rab C. Nesbitt), who plays the part of Perks the porter.